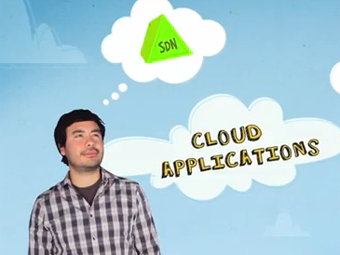 Software defined networking (SDN) has so far been used predominantly to optimise datacentre resources in the cloud. But it has also been much discussed in the telco sphere and operators have tested SDN applications for operational network elements. The application of SDN to transport and backhaul optimisation is so recent that there is little hard evidence to support SDN business cases for service providers. However, research released Thursday suggests that SDN can almost halve a perceived “backhaul shortfall” and save operators just under $5bn in capital expenses by 2017. A Strategy Analytics report published last year found a $9.2bn gap in expected demand and expected availability of backhaul capacity. As mobile data traffic grows, the investment required to meet users’ expectations of customer experience escalates. A capacity shortfall in backhaul networks has already begun to build and that backhaul gap may reach 16Pb (petabytes) globally by 2017, Strategy Analytics said. In a follow-up report published on behalf of Tellabs today, Strategy Analytics predicts that SDN can save mobile operators more than $4bn in capital expenses by 2017. 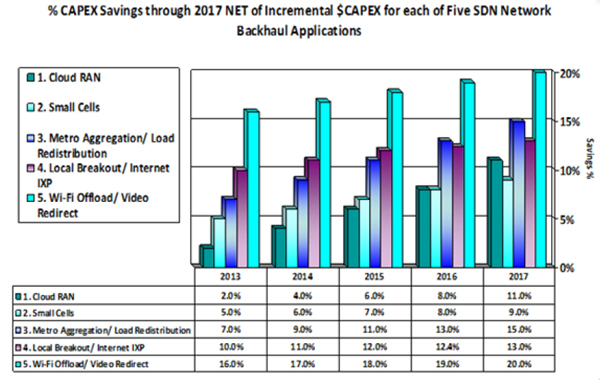 Savings stem from five key SDN applications for mobile backhaul networks and can help close almost half of the gap identified in Strategy Analytics’ earlier report by delivering network load sharing and dynamic resources allocation. Further new SDN control and resource management will dramatically lower Network Operations Backhaul Expense (OPEX). • Cloud-RAN (C-RAN) with ‘fronthaul’ connectivity. In this application, remote radio heads (RRHs) and antennas are remotely linked to base stations over fiber or very high speed microwave links. User and signaling traffic can burst at higher or lower speeds dynamically between multiple RRHs in the C-RAN over high-bandwidth connections to the base station radio. • Small Cells. Service providers can deploy small cells in logical clusters that are dynamically powered up and down. These small cells can be linked by backhaul over multiple access paths that vary dynamically with capacity demand. • Metro Aggregation/Load Redistribution. This application exploits the partial mesh or ring connectivity of today’s high-speed metro area networks. SDN redirects and aggregates mobile backhaul traffic to reduce peak loads and minimize congestion based on end-to-end delivery criteria. This approach can simultaneously improve user performance and operator bandwidth utilization. • Local Breakout. Here certain types of mobile traffic are directed straight to the Internet at the edge of the wireless network rather than passing through the core mobile network. This can significantly reduce the mobile network backhaul load for low-value services such as OTT streaming video. • Wi-Fi Offload/Video Redirect. This is similar to the previous app, as it minimizes traffic on core mobile backhaul networks. But with next-generation Wi-Fi roaming, mobile operators are able to maintain control and session visibility. Operators can even bring the session back to mobile broadband as the user leaves the Wi-Fi hotspot. In the next decade, significant traffic is expected to move seamlessly back and forth between Wi-Fi and mobile broadband networks. The researcher admitted that it is difficult to estimate the precise backhaul cost savings from using SDN because many of these applications are still in trials or have not yet been standardised, so accordingly, the estimates are based in part on preliminary estimates from vendors and early operator trials. According to the report, the largest single saving in capital expense value terms will come from Metro Aggregation/Load Redistribution. This application could contribute savings of $96m in 2013, rising to $1.1bn in 2017.